Sometimes, funny is all you need. 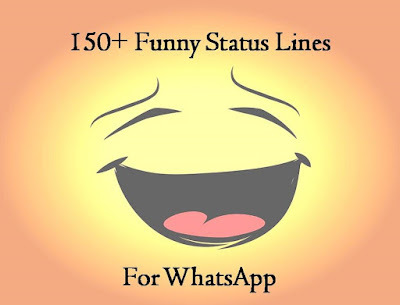 Update your status with our special collection of “150+ Funny Status Lines For WhatsApp” and be the reason that someone has a smile on their face today. Happy Reading!! 2. I would lose weight, but I hate losing. 3. I follow the quote, “Always be true to yourself” because I only lie to others! 4. I wish I could mute people in real life. 5. I don’t go looking for trouble. Trouble usually finds me. 6. Dear problems… Please give me some discount… I am your regular customer. 7. Take my advice, I don’t use it anyway. 8. Never laugh at your wife’s choices. You’re one of them. 9. Love may be blind, but marriage is a real eye-opener. 10. You can never buy love, but still you have to pay for it. 11. I’m so poor I can’t even pay attention! 12. I’m too lazy to stop being lazy. 13. I really want to work so hard. But being lazy is so much fun. 14. If I won the award for laziness, I would send somebody to pick it up for me. 15. I’m not lazy, I’m on energy saving mode. 16. I’m not lazy, I prefer the term “selective participation”. 17. I’m not lazy, I’m just very relaxed. 18. I’m not running away from hard work, I’m too lazy to run. 19. Laziness is the mother of all bad habits, but ultimately she is a mother and we should respect her! 20. Never give up on your dreams keep sleeping. 21. Shopping is an art. I am an artist. Respect Please. 22. I really need a day between Saturday and Sunday. 23. I love my job only when I’m on vacation. 24. I always arrive late at the office, but I make up for it by leaving early. 26. Behind every successful man is a surprised woman. 27. Behind every great man is a woman rolling her eyes. 28. The man is the head, but the woman is the neck. And she can turn the head any way she wants. 29. You can either be right, or you can be the husband. 30. In my house I’m the boss, my wife is just the decision maker. 31. Women’s apology: I’m sorry, but it was your fault. 32. Yes of course I am athletic… I surf the Internet every day. 34. I want someone to give me a Loan and then leave me Alone. 35. The richer you get, the more expensive happiness becomes. 36. I always dream of being a millionaire like my uncle! He’s dreaming too. 37. Talking to myself because I am my own consultant. 38. Of course I talk to myself. Sometimes I need expert advice. 39. I talk to myself because I like dealing with a better class of people. 40. I don’t need a hair stylist, my pillow gives me a new hairstyle every morning. 41. I swear my pillow could be a hairstylist. I always wake up with the weirdest hairdos. 42. I’m not crazy I prefer the term mentally hilarious. 43. The hardest thing I ever tried was being normal. 44. Out of my mind. Back in five minutes. 45. Hey there! Whatsapp is using me. 46. 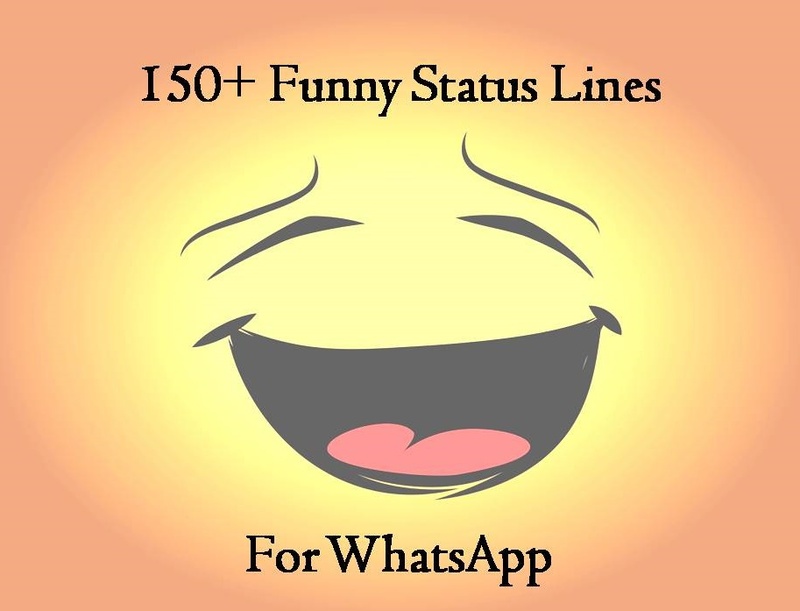 Hey, you are reading my status again? 47. Life is too short. Don’t waste it reading my Whatsapp status. 48. Hey you, yeah I’m talking to you, why the hell are you reading my status? 49. Hey you, yeah you. The one reading this. Wanna know a secret? You’re beautiful. Don’t ever give up. 50. If you are reading this then I’m sure you have nothing to do in your life. 52. My “last seen at” was just to check your “last seen at”. 53. Say it to my face, not through your status. 54. Stop checking my status better you have your own. 55. WAIT! Do you have appointment to see my status. 56. Not always Available.. Try your luck. 58. Battery low, please disturb later. 59. It may look like I’m doing nothing, but in my head I’m quite busy. 60. Don’t play stupid with me, I’m better at it! 61. Once they stop talking to you, they start talking about you. 62. Life gives hurdles, but I am an athlete. So it’s fun. 64. I really should do something with my life… maybe tomorrow. 65. I made a huge to do list for today. I just can’t figure out who’s going to do it. 66. When a door closes, another door should open, but if it doesn’t then go in through the window. 67. If Plan A fails, remember that you have 25 letters left. 68. Sometimes, life gives you a second chance because just maybe the first time you weren’t ready. 69. Always Give 100%, Unless You’re Donating Blood. 70. I Was reminded that my blood type is BE POSITIVE! 72. I was born to be a pessimist. My blood type is B Negative. 73. It’s not the fault of the mirror if you don’t like your reflection. 74. I’m just a mirror for you, You are good, I’m best, You are bad, I’m worst. 75. I don’t have time to hate the people who hate me because I’m busy loving the people who love me. 76. Come live in my heart, and pay no rent. 77. Dear stress, let’s break up. 78. I wish I had a delete button in my life. To delete some people, some memories, and some feelings. 80. Having one child makes you a parent; Having two you are a referee. 81. Did anyone ever notice that “STUDYING” is a mixture of STUDY and DYING? 82. I’m physically, emotionally and mentally exhausted. 83. Physically Mentally Emotionally TIRED. 84. Life: Besides gravity, nothing keeps me down. 85. When You’re Downie Eat A Brownie! 86. Waiting until the movie starts to eat your popcorn, hardest thing in the world. 87. Every time I have my picture taken I get hungry because I hear ‘cheese’ so I start to think of a nice cheese sandwich. 88. My hobbies are breakfast, lunch, and dinner. 89. A good laugh and a long sleep are the two best cures for anything. 90. Never judge the book by its movie. 91. It’s always the wrong person who teaches you the right things in life. 92. I know who I am, you have no need to explain. 93. I’m a sweet lil Girl, but if you make me mad, remember I always have a pocketful of crazy waiting to come out!! 94. Relax, it’s the weekend, just don’t blink or it will be all over. 95. Every weekend I do what I love most, absolutely nothing! 96. I love sleeping but I never want to go to sleep early. 97. At night, I can’t sleep. In the morning, I can’t wake up. 98. I am not single, I’m just Romantically Challenged. 100. We live in an era of smart phones and stupid people. 101. When I die, I want my grave to offer free WiFi so people will visit more often. 102. I love finding money in my clothes. It’s like a gift to me from me. 103. If life is not smiling at you, give it a good tickling. 104. When life gives you lemons, make lemonade. 105. Smiles are contagious… Be a carrier! 106. Happiness does not have a price tag so smile. 107. Don’t worry about what to wear today, your smile goes with any clothes. 108. Do not take life too seriously. You will never get out of it alive. 109. Brain: Be patient. Heart: Until when? 110. My road to success is always under construction. 111. May my haters live long to see my success. 112. Society is funny. They ask you to be yourself and yet they judge you. 113. It’s funny how when I’m loud, people tell me to be quiet. But when I’m quiet, people ask me what’s wrong with me. 114. I Smile Because I have No Idea What’s Going On! 115. I’m more confused than a chameleon in a bag of skittles. 116. I’m not sure how many problems I have because math is one of them. 117. Whenever I have a problem, I just sing. Then I realize my voice is worse than my problem. 118. Exercise? I Thought You Said Extra Fries! 119. Please God if you can’t make me slim make my friends FAT!!! 121. My six pack is protected by a layer of fat. 122. I didn’t lose my mind… I just sold it online! 123. Minds are like parachutes – they only function when open. 125. Sorry, I can’t go to work tomorrow, I fractured my motivation. 126. My boss told me to have a good day… so I went home. 129. My wallet is like an onion, opening it makes me cry. 130. I can’t believe I work this hard to be this poor. 131. I wish my wallet came with free refills. 132. Some people just need a high five. In the face. With a chair. 133. Sometimes I wish I was an octopus, so I could slap eight people at once. 134. Some days I wish I had the wisdom of a 90 year old, the body of a 20 year old, and the energy of a 3 year old. 135. I am, indeed, a king, because I know how to rule myself. 136. I don’t follow others, I only follow my orders because I am my own boss. 137. If you obey all the rules you miss all the fun. 138. The future is shaped by your dreams, so stop wasting time and go to sleep! 139. Please cancel my subscription to your issues. 140. I’d agree with you but then we’d both be wrong. 141. It’s alright if you don’t agree with me… I can’t force you to be right. 142. If people are talking behind your back, be happy that you are the one in front. 143. I’m born to express, not to impress. 144. Don’t follow me because I don’t even know where I’m going. 145. I don’t need the Prince Charming to have my own happy ending. 146. My prince is not coming on a white horse… He’s obviously riding a turtle, and definitely lost. 147. My Prince Charming is not coming on a white horse.. He’s obviously riding on a turtle somewhere really confused..
148. I’m not really your friend until I start insulting you on a daily basis. 149. I never insult people I only tell them what they are. 150. If someone hates you for no reason give them a reason. 151. A man in not rewarded for having a brain but for using it well. 152. I am not changed it’s just I grew up and you should try too. 153. I know I am awesome, so I don’t care about your opinion. 154. I was born intelligent, but education ruined me. 155. Choose a lazy person to do a hard job. Because a lazy person will find an easy way to do it. 156. The quickest way to double your money is to fold it in half and put it in your back pocket. 157. Maybe if we tell people the brain is an app, they’ll start using it. 158. The most common cause of stress nowadays is dealing with idiots. 159. A wise man can always be found alone. A weak man can always be found in a crowd. 160. Do not be so open-minded that your brains fall out. 161. Don’t try to fix me I’m not broken. 162. When nothing goes right, go left. 163. If you can’t convince them confuse them. 164. I let my haters be my motivators. 165. I love rumors. I always find out amazing things about myself that I never knew about. 166. If you are always trying to be normal, you will never know how amazing you can be. 167. If you’re going to be two-faced, at least make one of them pretty. 168. Don’t trust everything you see. Even salt looks like sugar!! 169. Some people are like clouds. When they go away, it’s a brighter day. 170. It’s funny how people say they miss you, but don’t even make an effort to see you or speak to you. 171. I hate people who steal my ideas before I think of them. 172. I have not failed. I’ve just found 10000 ways that won’t work. 173. Experience is the name everyone gives to their mistakes. 174. If nobody hates you, then you are doing something boring. 175. One mistake and everyone judges you.